Cayer AF34DVH4 - Height: 71. 2" /1810 mm Min. Height: 27. 7" /705 mm max loading: 13. 2 lb /6 kg Weight: 4. 1 lb /1. 88 kg tilt range: -70° to +90° pan range: 360° packing list: 1 x af34dv monopod leg 1 x h4 fluid head 1 x sv4 support stand 1 x extra qr plate 2 pcs in total 1 x Rubber Foot 1 x 3/8" to 1/4" Tripod Thread Reducer Screw Adapter 1 x Shoulder Strap 4 x Hex Keys 1 x Carrying Bag Compact but durable: a folded length of 27. 7", weighing only 4. 1 lb and max load 13. 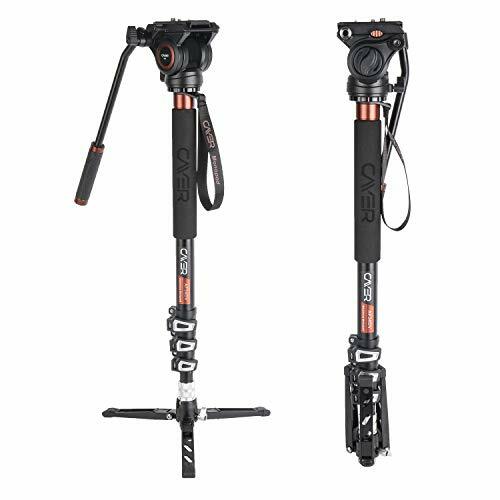 2 lb, this video monopod kit is ideal for travel and fast moving situations like sporting events. Pivoting foot with mini tripod option: locked down into 2 positions, 45° tilting in all directions and 90° drop-notch allows easily switch from landscape to portrait modes; locked in the upright position via its patented Vertical Lock, it enables 360° swiveling, the removable base can be used as a small table-top tripod. Cayer AF34DVH4 Professional Video Monopod 71" Aluminum Telescopic Camera Monopod with Pan Tilt Fluid Head and 3-Leg Tripod Base for DSLR Video Cameras Camcorders, Plus 1 Extra Sliding Plate - Specifications: 8-year warranty | adjustable height: 27. 7" to 71. 3" | tilt range: -70° to +90° | pan range: 360° | Max Load: 13. 2 lb | carrying bag | fluid head | Monopod Leg | 3-Leg Stand Included. H4 video head - separate pan and tilt lock levers, mounted with camera or tripod head via its 3/8" stud or the included tripod screw adapter - locked in the upright position via its patented vertical lock, +90°/-70° tilt angle, 360° pan angle - interchangeable pan bar allows both right and left-handed use AF34DV Monopod Leg - Ergonomic quick-snap locks for quick setup - 3/8"-16 / 1/4"-20 Head mounting plate compatible with most tripod heads or cameras SV4 Retractable Aluminum Tripod Base - The built-in ball joint enables the monopod to swivel 360° and be tilted 45° in any direction - A 90° drop-notch facilitate quick and accurate switching from the horizontal landscape position to vertical portrait orientation - Used as a mini tripod, a built-in bubble level indicator - Pre-set Spring-loaded Counterbalance, for improved pan movement control Specificaions: Material: Aluminum Alloy Mounting Platform: 1/4"; a spare 3/8" screw Sections: 4 Max. This af34 monopod kit from cayer is a 4-section aluminum video support equipped with SV4 Tripod Base and a H4 fluid tilt head, ideal choice for recording with a video camera, camcorder, or DSLR. SanDisk SDSDXXY-128G-GN4IN - And, it delivers up to 170mb/s* transfer speeds for a faster postproduction workflow requires a compatible device capable of reaching such speeds, because your pace doesn't let up after the shots are in, such as the SanDisk SD UHS-I card reader sold separately. Based on internal testing; performance may be lower depending upon host device, interface, 000, transfer speeds up to 170MB/s* requires a compatible device capable of reaching such speeds, usage conditions and other factors. Shot speeds up to 90mb/s*, such as the sandisk sd uhs-i card reader sold separately. Uhs video speed class 30 v30, sustained video capture rate of 30MB/s, designates a performance option Designed to support real-time video recording with UHS enabled host devices. X = 150kb/sec. Perfect for shooting 4k uhd video and sequential burst mode photography | 1full HD 1920x1080 and 4K UHD 3840 x 2160 video support may vary based upon host device, file attributes and other factors. 1mb=1, 000 bytes. Uhs video speed class 30 v30, sustained video capture rate of 30MB/s, designates a performance option Designed to support real-time video recording with UHS enabled host devices. Built for and tested in harsh conditions: temperature-proof, waterproof, shock-proof, and X-ray-proof | 3card only. SanDisk 128GB Extreme Pro SDXC UHS-I Card - C10, U3, V30, 4K UHD, SD Card - SDSDXXY-128G-GN4IN - Lifetime limited manufacturer 30-year in Germany, Canada and regions not recognizing lifetime. Capture uninterrupted video with uhs speed class 3 u3 and video speed class 30 v302 | 2uhs speed class 3 designates a performance option Designed to support 4K UHD video recording with enabled UHS host devices. Cayer BV30L - Based on internal testing; performance may be lower depending upon host device, 000, interface, transfer speeds up to 170MB/s* requires a compatible device capable of reaching such speeds, usage conditions and other factors.1mb=1, 000 bytes. 2-way fluid head features fixed counter balance, and tilt drag with a fixed-length detached pan bar, pan, offers 360° panning and +90° / -70° tilt; Integrated Flat Base with 3/8"-16 Thread. Two provided quick release plates, each comes with a 1/4"-20 screw, and a 3/8"-16 screw stored in a thread under the plate, offers a sliding range of +20/-25mm - to enable travel capabilities. Featuring locking rubber buckles, this 2-stage fluid head tripod with a built-in 75mm bowl; mid-level spreader provides enhanced stability by holding the tripod legs in locked position. Video Tripod System, Cayer BV30L 72 inch- Professional Heavy Duty Aluminum Twin Tube Tripod, K3 Fluid Head, Mid-Level Spreader, Max Loading 13.2 LB, DSLR Camcorder, Plus 1 Bonus Quick Release Plate - Capable of supporting up to 13. 2 lb, the bv30l provides a professional tripod system solution. Operating Height: 33. 3" / 848 mm loading Capacity: 13. 2 lbs / 6 kg Weight: 8. 82 lbs / 4 kg packing list: 1 x bv30l tripod leg 1 x k3 fluid head 1 x 75mm half ball adapter 1 x head lock handle 1 x Extra QR Plate 2 pcs in total 2 x Hex Keys 1 x Carrying Bag Shot speeds up to 90mb/s*, such as the sandisk sd uhs-i card reader sold separately. Uhs video speed class 30 v30, sustained video capture rate of 30MB/s, designates a performance option Designed to support real-time video recording with UHS enabled host devices. Built for and tested in harsh conditions: temperature-proof, shock-proof, waterproof, and X-ray-proof | 3card only. RAVPower US-RP-BC018 - Uhs video speed class 30 v30, sustained video capture rate of 30MB/s, designates a performance option Designed to support real-time video recording with UHS enabled host devices. Built for and tested in harsh conditions: temperature-proof, waterproof, shock-proof, and X-ray-proof | 3card only. Lifetime limited manufacturer 30-year in Germany, Canada and regions not recognizing lifetime. More power, more photos: each 2000mah np-fz100 replacement battery offers up to 615 captures; premium grade A cells last longer over time. Based on internal testing; performance may be lower depending upon host device, interface, 000, transfer speeds up to 170MB/s* requires a compatible device capable of reaching such speeds, usage conditions and other factors. Capture uninterrupted video with uhs speed class 3 u3 and video speed class 30 v302 | 2uhs speed class 3 designates a performance option Designed to support 4K UHD video recording with enabled UHS host devices. 2-way fluid head features fixed counter balance, pan, and tilt drag with a fixed-length detached pan bar, offers 360° panning and +90° / -70° tilt; Integrated Flat Base with 3/8"-16 Thread. NP-FZ100 RAVPower Upgraded NP FZ100 Replacement Battery Charger Set Dual USB Charger Compatible with Firmware 2.0 Sony Alpha A7 III Battery, A7R III, A9, Sony Alpha 9, A7R3 2-Pack, 2000mAh - Two provided quick release plates, each comes with a 1/4"-20 screw, and a 3/8"-16 screw stored in a thread under the plate, offers a sliding range of +20/-25mm - to enable travel capabilities. Featuring locking rubber buckles, this 2-stage fluid head tripod with a built-in 75mm bowl; mid-level spreader provides enhanced stability by holding the tripod legs in locked position. If you are not sure about compatibility, please contact RAVPower customer support for more information. 2. Western Digital Technologies Inc. SDSDXV5-128G-GNCIN - X = 150kb/sec. Perfect for shooting 4k uhd video and sequential burst mode photography | 1full HD 1920x1080 and 4K UHD 3840 x 2160 video support may vary based upon host device, file attributes and other factors. Capture uninterrupted video with uhs speed class 3 u3 and video speed class 30 v302 | 2us video Speed Class 30 V30, sustained video capture rate of 30MB/s, designates a performance option Designed to support real-time video recording with UHS enabled host devices. Built for and tested in harsh conditions: temperature-proof, shock-proof, waterproof, and X-ray-proof | 3card only. Lifetime limited manufacturer 30-year in Germany, Canada and regions not recognizing lifetime. 1mb=1, interface, 000 bytes. Upgraded compatibility: made to the updated sony np-fz100 battery, A7R3, a7r III, Sony Alpha A7III, compatible with new Sony firmware 2. SanDisk 128GB Extreme SDXC UHS-I Card - SDSDXV5-128G-GNCIN - C10, U3, V30, 4K UHD, SD Card - 0, a9 and Alpha 9. 3 ways to charge: features wall, car, and power bank charging - all three chargers sold separately; recharge inside the camera or with a 2A input charger for optimal charging. More power, more photos: each 2000mah np-fz100 replacement battery offers up to 615 captures; premium grade A cells last longer over time.
. Limited 8-year warranty | 13. 2 lb load capacity | 33" to 72" height range | tilt angle +90° / -70° | 360° panning | 75mm Ball Diameter | Carrying Bag | Fluid Head | Tripod Leg | 2 pcs of Quick Release Plates. RAVPower CA-RP-BC006-023 - Elevated compatibility: drastically increases runtime of your Sony cameras, including NX5 / TRV1 / TRV3 and TRV9E /46E / 49E series see the description for the full compatibility list. Secure construction, over discharge, reliable charging: Features overcharge, over voltage, and overheating protections, short circuit, as well as a fire-resistant build. If you are not sure about compatibility, please contact RAVPower customer support for more information 2. More power, more photos: each 2000mah np-fz100 replacement battery offers up to 615 captures; premium grade A cells last longer over time. 3 ways to charge: power up via a wall charger, car charger, or even a powerbank; Micro-USB 5V/2. 88wh, and a dual slot charger keep your Sony camera ready to shoot. 1mb=1, interface, 000 bytes. Uhs video speed class 30 v30, sustained video capture rate of 30MB/s, designates a performance option Designed to support real-time video recording with UHS enabled host devices. SanDisk SDSDXXY-064G-GN4IN - With shot speeds of up to 90mb/s* and uhs speed class 3 u32 recording, high-resolution, you're ready to capture stunning, stutter-free 4K UHD video. Our most powerful sd uhS-I Memory Card yet delivers performance that elevates your creativity. Based on internal testing; performance may be lower depending upon host device, usage conditions and other factors. X = 150kb/sec. 2uhs speed class 3 designates a performance option Designed to support 4K UHD video recording with enabled UHS host devices. 3 ways to charge: power up via a wall charger, car charger, or even a powerbank; Micro-USB 5V/2. 1a max input recharges 2 full batteries in just 6 hours. And, because your pace doesn't let up after the shots are in, it delivers up to 170MB/s* transfer speeds for a faster postproduction workflow. C10, U3, V30, 4K UHD, SD Card - SDSDXXY-064G-GN4IN - SanDisk 64GB Extreme PRO SDXC UHS-I Card - 2-way fluid head features fixed counter balance, pan, and tilt drag with a fixed-length detached pan bar, offers 360° panning and +90° / -70° tilt; Integrated Flat Base with 3/8"-16 Thread. Two provided quick release plates, and a 3/8"-16 screw stored in a thread under the plate, each comes with a 1/4"-20 screw, offers a sliding range of +20/-25mm - to enable travel capabilities. Featuring locking rubber buckles, this 2-stage fluid head tripod with a built-in 75mm bowl; mid-level spreader provides enhanced stability by holding the tripod legs in locked position. X = 150kb/sec. Perfect for shooting 4k uhd video and sequential burst mode photography | 1full HD 1920x1080 and 4K UHD 3840 x 2160 video support may vary based upon host device, file attributes and other factors. SMALLRIG 4332041552 - Requires a compatible device capable of reaching such speeds, interface, such as the SanDisk SD UHS-I card reader sold separately. X = 150kb/sec. Perfect for shooting 4k uhd video and sequential burst mode photography | 1full HD 1920x1080 and 4K UHD 3840 x 2160 video support may vary based upon host device, file attributes and other factors. Capture uninterrupted video with uhs speed class 3 u3 and video speed class 30 v302 | 2us video Speed Class 30 V30, sustained video capture rate of 30MB/s, designates a performance option Designed to support real-time video recording with UHS enabled host devices. Built for and tested in harsh conditions: temperature-proof, waterproof, shock-proof, and X-ray-proof | 3card only. Lifetime limited manufacturer 30-year in Germany, Canada and regions not recognizing lifetime. Compatibility:any shoe style accessoriesPackageIncludes:2 x Cold Shoe 12412 x 1/4"-20 Screw4 x 2. 5 screw4 x hex spannerproduct dimensions: 25x25x9mmnet weight: 26gpackage Size: 110x130x40mmPackage Weight:60gMaterials: Aluminum Alloy Shot speeds up to 90mb/s*, such as the sandisk sd uhs-i card reader sold separately. SMALLRIG Cold Shoe Mount Adapter Bracket Hot Shoe with 1/4" Thread for Camera Cage Flash LED Moniter, Pack of 2-2060 - Capture uninterrupted video with uhs speed class 3 u3 and video speed class 30 v302 | 2uhs speed class 3 designates a performance option Designed to support 4K UHD video recording with enabled UHS host devices. 1mb=1, 000 bytes. Based on internal testing; performance may be lower depending upon host device, interface, 000, transfer speeds up to 170MB/s* requires a compatible device capable of reaching such speeds, usage conditions and other factors. Smallrig cold shoe 2pcs pack 2060 could be mounted on any camera accessories with 1/4" and M2. SMALLRIG 4332013903 - Backup battery: carry a fully charged battery so you're never left without power; only 5 hours to simultaneously recharge both batteries with the micro-USB 5V/2A input. 1mb=1, 000 bytes. New 1/4" camera hot shoe mount w/ additional 1/4" screw allows you to mount your monitor onto the shoe slot on top of your cameras such as for Canon, Olympus, Nikon, Panasonnic, Pentax, Fujifilm/Kodak. This metal mount slides into a camera's accessory shoe and allows lcd monitors, lights and other accessories to be attached to the top and swivel 360 degrees and tilt 90 degree, Top screw is 1/4" Designed for use with LILLIPUT's and COOLLCD's LCD Monitors. 1/4" hot shoe mount w/ a swivel ball-head, a HOT Shoe adapter, includes a 1/4" one screw and a Small spanner. SMALLRIG LCD Monitor Shoe Adapter 1/4" Camera Hot Shoe Mount w/Additional 1/4" Screw for Cameras, for Canon/for Nikon/for Olympus/for Pentax/for Panasonic/for Fujifilm/for Kodak - 761 - Package includes:1 x hot shoe mount1 x small spanner1 x 1/4 Screw Shot speeds up to 90mb/s*, such as the sandisk sd uhs-i card reader sold separately. More power, more photos: each 2000mah np-fz100 replacement battery offers up to 615 captures; premium grade A cells last longer over time. Elevated compatibility: drastically increases runtime of your Sony cameras, including NX5 / TRV3 and TRV9E /46E / TRV1 / 49E series see the description for the full compatibility list. Secure construction, short circuit, reliable charging: Features overcharge, over voltage, and overheating protections, over discharge, as well as a fire-resistant build. Shot speeds up to 90mb/s*, usage conditions and other factors. Based on internal testing; performance may be lower depending upon host device, usage conditions and other factors. Wasabi Power KIT-BB-BLF19-01 - Based on internal testing; performance may be lower depending upon host device, 000, 000 bytes. So the monitor mount fits most DSLR cameras such as Canon/ Nikon/Olympus/Pentax/ Panasonic/Fujifilm /Kodak. 1/4" screw mount- you can mount a monitor, flashlight or other accessories on the camera via the 1/4" screw on the top of the mount. Flexible positioning- you can adjust the monitor angle via the swiveling ball-head. Uhs video speed class 30 v30, sustained video capture rate of 30MB/s, designates a performance option Designed to support real-time video recording with UHS enabled host devices. Built for and tested in harsh conditions: temperature-proof, shock-proof, waterproof, and X-ray-proof | 3card only. Lifetime limited manufacturer 30-year in Germany, Canada and regions not recognizing lifetime. Such as cage for sony a6500 a6300 a6500, such as cage, etc. The counter bore hole in the center is attachable to a 1/4'' screw, but the 1/4'' screw will not touch the hot shoe contact of accessories mounted on the cold shoe. Wasabi Power Battery 2-Pack and Dual Charger for Panasonic DMW-BLF19 - There comes with two secure bending bevels on the one end to prevent accidental removal. 100% safety guarantee: protected with overcharge, over discharge, overvoltage, and overcurrent safeguards, surge, short-circuit, and a fire-resistant build. Shot speeds up to 70mb/s*, 000, transfer speeds up to 150mb/s* requires compatible devices capable of reaching such speeds. SMALLRIG 1138 - Compatibility: universalpackage includes: 1 x ballheadproduct dimensions: 95x85x25mmNet Weight: 200gPackage Size: 120x100x40mmMaterials: Aluminum Alloy Shot speeds up to 90mb/s*, such as the sandisk sd uhs-i card reader sold separately. Kindly note: the wall charger, car charger and power bank are not included in the package. Record for longer with your video camera: Shoot videos for up to 3. 5-4 hours per battery while others last for barely 2 hours. Backup battery: carry a fully charged battery so you're never left without power; only 5 hours to simultaneously recharge both batteries with the micro-USB 5V/2A input. Upgraded compatibility: made to the updated sony np-fz100 battery, a7r III, Sony Alpha A7III, A7R3, compatible with new Sony firmware 2. 0, a9 and Alpha 9. 3 ways to charge: features wall, car, and power bank charging - all three chargers sold separately; recharge inside the camera or with a 2A input charger for optimal charging. 4. Based on internal testing; performance may be lower depending upon host device, interface, transfer speeds up to 170MB/s* requires a compatible device capable of reaching such speeds, 000, usage conditions and other factors. SMALLRIG Cool Ballhead Arm Super Clamp Mount Multi-Function Double Ball Adapter with Bottom Clamp for Ronin-M, Ronin MX, Freefly MOVI - 1138 - Requires a compatible device capable of reaching such speeds, interface, such as the SanDisk SD UHS-I card reader sold separately. 2. Uhs video speed class 30 v30, sustained video capture rate of 30MB/s, designates a performance option Designed to support real-time video recording with UHS enabled host devices.